This is a contribution to For the Love of Film: The Film Preservation Blogathon being led by Marilyn Ferdinand of Ferdy on Films and Farran Smith Nehme, aka The Siren, at The Self-Styled Siren. With all the hype surrounding the release of yet another iteration of Sherlock Holmes this past Christmas, many might have overlooked a rare cinephilic treat related to its attendant publicity. Turner Classic Movies celebrated the character—one of (if not) the most often depicted in cinema—with a day-long marathon of his films. From Basil Rathbone to Peter Cushing, most of the actors that have played the eccentric detective were represented. 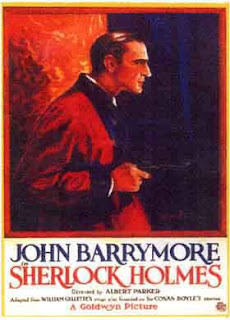 The most interesting film was reserved for TCM's regular Silent Sunday showcase, the 1922 Sherlock Holmes starring the renowned John Barrymore as the eponymous sleuth. This was the television debut of the previously lost silent, restored by the George Eastman House with the help of the National Film Preservation Foundation in 2001. 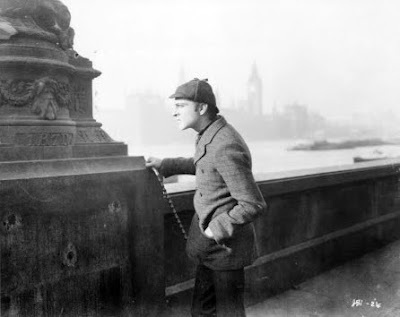 Sherlock Holmes is representative of why the NFPF's work (as well as that of countless other cinematic archives too numerous to mention) is so important in preserving our cinematic heritage. According to their website, "fewer than 20% of U.S. feature films from the 1920s survive in complete form in American archives; of the American features produced before 1950, only half still exist." As it stands, this 85-minute cut of Holmes, the most complete version yet, still has sections that are pretty clearly missing (sometimes even in the middle of a scene) and perhaps lost forever. The George Eastman House's work on this film give movie enthusiasts of all stripes another portal into the past, and it was made possible with a grant from the NFPF. If you are a fan of Sir Arthur Conan Doyle's literary creation, you will learn that this silent is one of the least faithful interpretations of the character. The film begins with Holmes as a young college student, making the acquaintance of a classmate by the name of Watson. He still hasn't found a line of work suitable for his unique deductive talents. 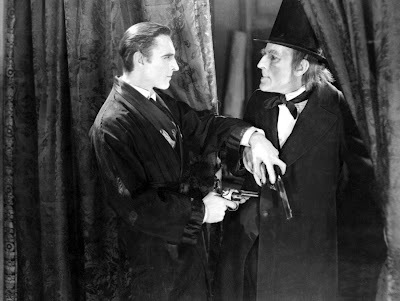 But a mystery crops up, one which he won't be able to solve for years despite knowing that a Professor Moriarty (played by a frightening Gustav von Seyffertitz) is somehow behind it. And in working the case he'll meet the love of his life, Alice Faulkner (Carol Dempster). Yes, you heard right. Holmes falls in love. Who knew that a film made while Holmes' author Doyle was still alive could somehow depict the character less accurately than Guy Ritchie does with Robert Downey, Jr. in the role? Well, disappointed Holmes aficionados aside, movie buffs can find plenty to appreciate in the film. 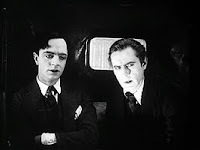 The American movie is one of the few silents to have done extensive location work in London. And though the setting isn't period accurate to Doyle's stories, it is historically fascinating to see early automobiles and telephones in use by the characters and in the background. Also of note is Barrymore's performance. The contemplative, stoic detective elicits a subdued portrayal from the usually theatrical Barrymore (Grand Hotel), one more palatable to today's audiences than the ones typically found in his other films. 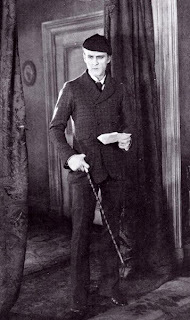 1922 was the year that Barrymore would give his best regarded stage performance as Hamlet. The female lead, Dempster, makes a rare appearance in a film outside of her collaborations with mentor and lover, D.W. Griffith (Intolerance). Future Hollywood gossip columnist Hedda Hopper has a small but pivotal appearance in the film as a woman working for Moriarty. But most interesting is the fact that Sherlock Holmes features the debuts of two actors who would go on to greater acclaim in the future. Roland Young, who plays Dr. Watson, would go on to some measure of fame for his Oscar-nominated role as the titular Topper (1937). And in the part of the confidential informant, Foreman Wells, is an actor who went on to portray a famous detective in his own right, William Powell. The greatest crime is to ignore the fact that even flawed films such as Sherlock Holmes provide immeasurable value in the amount of opportunities one is offered to learn about the cultural, social, and historical details so unique to our continuing cinematic legacy. Please donate any amount you can to support the efforts of the National Film Preservation Foundation. The fact is, Adam, that Ritchie's film takes very few liberties with the HOLMES mythos. The character of Irene Adler (Rachel McAdams) is portrayed as a woman that fascinated Holmes more than one he is actually ion love with, despite the way the marketing rolled it out. She is one of the more notable female character in Doyle's stories, appearing in A SCANDAL IN BOHEMIA. This story also appears to be the basis for the 1922 reworking I review above. Dempster... is quite bad, even factoring in the performance style of the time. The less said of her the better. Thank you for sharing your feelings about the film. I remember reading about years ago in a book by Everson. It had been thought lost until someone found the film as it had been broken down for tinting and toning, with all the shots out of order. Everson arranged a screening with the director, who was past it, and someone who played Holmes later. They couldn't make sense of it. I was happy to see that the jigsaw puzzle has been solved. The trouble with the story is that it follows the stage version written by American William Gillette, who played the part for many, many years. He added the love interest. I asked my daughter, who had never seen Carol Dempster, what she thought of her looks. She didn't think much. Her performance was not impressive, either. Thanks for this, Tony, and sorry to get to comment on it so late - there's been a WHOLE lot of blogathon to catch up on. I do hope some of the lost footage shows up because the film is quite confusing as it stands. I agree, however, that Barrymore is a standout. 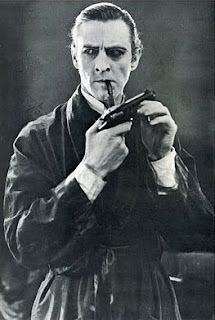 He would have been the definitive Holmes for generations to come if this film had not remained hidden so long. And yes, seeing Powell was a huge treat! Joe and Marilyn, I'd like to thank each of you for stopping by and commenting. I hope to see you around these parts again. Joe, thank you also for your contribution to the blogathon. I've only been able to skim it (since we're getting ready to leave on a vacation), but it looks like a fascinating account on the history of nitrate that I recommend everyone to jump over to and read. Marilyn, kudos to you again for co-hosting such an inspired blogathon.